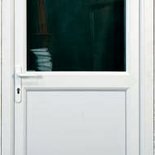 Lidget Compton have a range of well made timber doors for their concrete garages which many people like the look of. The standard garage door is available in widths of 3ft and 4ft. 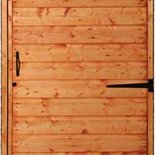 Besides these two doors there is an option for a Deluxe door which is 4ft wide. All these garage doors can be hung left or right and can even open inwards as well as outwards. 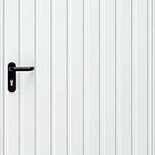 Lidget Compton range of concrete garage steel doors is likely to appeal to people required a little more security than the standard timber door. Solidly made from sturdy steel they are available in widths of 3ft wide in vertically ribbed solid doors, Georgian doors and half glass doors. There is a further option for a 4ft vertically ribbed solid door as well. All these garage doors can be hung left or right and can even open inwards as well as outwards. Lidget Compton modern and clean looking range of PVCu garage doors shows clean lines as well as ease of cleaning. With garage door options of Fully Glazed, Half Glazed, Fully Boarded in White and timber effect Decograin, Light Oak and Rosewood there should be an option for your new concrete garage. Available in widths of 3ft and 3ft 6in. Can open in or out as well as being hinged left or right. Complete with 3 point locking as standard for security.